Unconventionals have grown to take an increasingly larger share of the oil and gas industry. Hydraulic fracturing is attracting ever greater attention across the world thanks to the US shale revolution. Meanwhile, coal-bed methane (CBM) development is becoming more prominent, and drillers are starting to turn their attention to such technically challenging resources as methane hydrates. Looking for more UOGM articles? Or would you like to find out more about the publication? Keep reading. Unconventional Oil and Gas Monitor (UOGM) has covered the sector’s climb to prominence from the beginning and continues to track the development of the unconventional industry globally. Last year, US oil represented 10% of the world’s total crude output on the back of growing tight oil production, according to the US Energy Information Administration (EIA). Meanwhile, the shale gas boom has prompted operators in both the US and Canada to propose a number of LNG projects as they seek to tap into plentiful domestic supplies of feedstock gas and open up new markets. Now countries such as China, Argentina and Poland are striving to replicate the North American shale revolution, but attempts to bring unconventional development to new countries have been met with considerable challenges, ranging from geological, technological and regulatory hurdles to environmental opposition to fracking. UOGM provides commentary, analysis, news and local press stories on global unconventional development. UOGM covers the fields of shale oil, shale gas, CBM, coal gasification, coal- and gas-to-liquids (CTL and GTL), kerogens and methane hydrates. 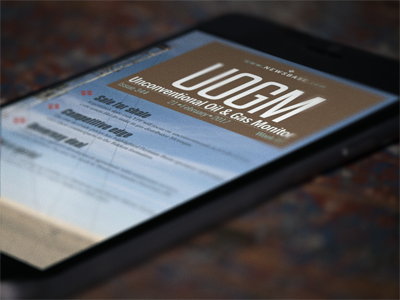 If you would like to try UOGM we can offer you a, no obligation, free trial, giving you a chance to get to know the publication and get hooked on the quality content. No credit card required. "Great company and people to work with – and UOGM is an awesome source for tracking all unconventional activities around the globe"